Every mobile engineering team -- including Google's -- struggles to make its applications available to all users on all devices. Even if you scope your work to today's smartphones, you're left with no less than five major operating systems. But we pay this cost because native code is often the only way to build an app that's rich enough and fast enough to meet users' needs. Enter the mobile web. Having a web application also means we can launch products and features as soon as they're ready. And for users, the latest version of the app is always just a URL and a refresh away. Of course: what sounds good in theory doesn't always materialize in practice. So back in April 2009 our team began re-building Gmail for mobile for today's modern browsers. We wanted to know: Could the mobile web support Gmail's basic and advanced features? Could we stuff the app with functionality while still keeping it fast and responsive? Today, and for the first time, we have answers to both questions. So yes, HTML5 and the mobile web are clearly up to the task of building rich and powerful apps. But speed is arguably the most important feature of any application. And we've remained unsatisfied with Gmail's performance on the mobile web. Until now. As of today, and thanks to numerous optimizations, I'm happy to report that Gmail for mobile loads 2-3x faster than it did in April (see Figure 1). In fact on newer iPhone and Android devices, the app now loads in under 3 seconds. So yes, the mobile web can deliver really responsive applications. 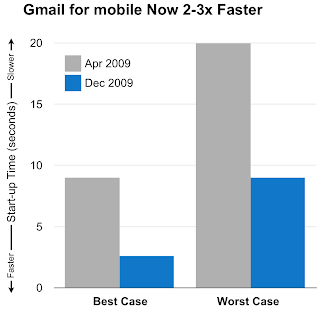 Figure 1: Best and Worst Case Gmail for mobile start-up times, April 2009 vs. December 2009. All figures recorded on an iPhone 3G with EDGE data access. The Gmail for mobile team isn't done, of course. We've focused primarily on performance over the past few months, but many other features and optimizations are on the way. So keep visiting gmail.com for the latest and greatest version of the app. Looking ahead, it's also worth noting that as a worldwide mobile team, we'll continue to build native apps where it makes sense. But we're incredibly optimistic about the future of the mobile web -- both for developers and for the users we serve. Great! But we need this version available to more languages. I don't want to change Gmail to english just to use the new version on my phone. I've been following the progress with my iPod Touch and I have to say awesome job! One huge request. The Palm Pre also has a WebKit browser and Google's slowly been updating more sites to recognize it and treat it with the same respect as the iPhone and Android - can you please extend the new and improved gmail mobile to us Pre users? We'd all really appreciate it. That's why we love Google!! I love Google, did you notice? When will you open up the proper mobile version of Gmail to other browsers such as Opera Mobile? The browser supports pretty much everything you are doing, but are arbitrarily being blocked out. Why? I second lowlight's suggestion. Please bring this functionality to Opera Mobile. Windows Mobile users will thank you for it, considering we don't have a native GMail app and Google Sync still doesn't have the deletion/trash flexibility like the advanced IMAP controls allow. One thing NOT cool about current address autocompletion, is that on commit it just inputs the address not prefixed by the person's name (like "Peter "). People change their emails addresses, and we update our address book to reflect those changes. Problem is then e-mails with no names become anonymous and lost in an ocean of e-mails: search by name (which is the only sensible search) can no longer track those. Suggestion: enable iPhone fullscreen when I save gmail to the Home Screen. Does Google agree with Mozilla Foundation that this will make app store/sites irrelevant? How about supporting gestures available in mobile (e.g. tap, strike, long click...) in GWT apps? +1 for iPhone full-screen when saved to Home Screen! +1 on the Opera Mobile browser. An actual majority of the users are not on smartphones (outside designer circles). @Sin Trenton: Opera Mobile is different from Opera Mini, which is what they use on non-smartphones. I'm not sure if Opera Mini supports everything needed. would be great to see a opera widget for a real gmail app! or a native winmo gmail app. I use a lot of conversations on gmail and the lack of a real app(non ipod or android) to manager them is a real problem. I guess that changing your ssl certificate just helped, by making millions of users no longer able to use Mobile Gmail because their phones are no longer compatible. Less users, more speed, no magic. I love the mobile Gmail site, but there's one thing that it doesn't do that precludes me from using it over the native Android app: push Gmail. I rely on that heavily, so without that I want to keep the native app. Would this "update" be the reason I can't bring up gmail on Mobile Web 2.0 anymore? I want the old version back!! If a Google employee happens to read this I would really like to know if there is any particular reason fort this. Thanks and I love your work! !